Uruguay has relatively strong state institutions, low levels of corruption, and some of the lowest crime rates in the region. Centro de Archivos y Acceso a la Información Pública (CAinfo) reported two attacks against Radio Canelones. Centro de Archivos y Acceso a la Información Pública (CAinfo) reported two attacks against Radio Canelones. The first incident took place in November 2018, when the broadcaster's electrical installation and transmission equipment were destroyed. The second attack, occurred on 24th January 2019 when a group of individuals broke into the radio station building, destroying the floor and some transmission machines. 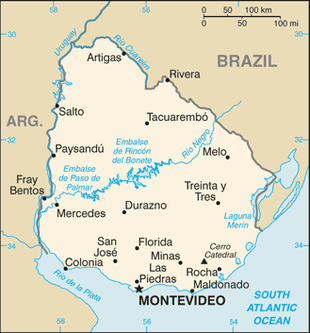 Radio Canelones is a long-standing radio station linked to the Uruguayan Communist Party, located in the Department of Canelones, 50 kilometres from the capital city of Montevideo. "The action clearly aimed to get Radio Canelones off the air, since they destroyed all the necessary elements for the radio transmission but did not steal anything." In another development, on 7th January 2019, the government issued a decree approving the 4th Open Government National Action Plan, which includes a commitment to reform the Access to Public Information Law. The reform process will include the participation of government authorities and civil society and is expected to be ready by December 2019. On 25th November 2018, an incident between the Minister of Internal Affairs and protesters from the tobacco sector took place during the reopening of a route between the cities of Rivera and Artigas in northern Uruguay. While the Minister of Public Works and Transport was delivering a speech, some tobacco workers attempted to deploy a banner with the message: "No more pressure. The tobacco family wants to work in peace". According to a video, the Minister of Internal Affairs, Eduardo Bonomi, leaned back intentionally against the banner unfurled by the protesters, prompting a struggle with the demonstrators, after which security intervened and detained two people. Freedom of association is constitutionally guaranteed and upheld in practice. A wide array of CSOs exist, including co-operatives, informal grassroots groups, social services provider organisations and advocacy CSOs dealing with democratic governance issues. Freedom of association is constitutionally guaranteed and upheld in practice. A wide array of CSOs exist, including co-operatives, informal grassroots groups, social services provider organisations and advocacy CSOs dealing with democratic governance issues. The freedoms to unionise, collectively bargain and strike are legally guaranteed and mostly respected, and trade unions are quite influential.Uruguay is the only country in the region that the International Trade Union Confederation (ITUC) describes as enduring only ‘sporadic’ violations of trade union rights. No legal restrictions exist for the foreign funding of CSOs. Activism is a safe endeavour in modern-day Uruguay. While human rights CSOs and INGOs have repeatedly denounced inconsistent treatment of past human rights violations resulting in impunity for crimes committed during the 1973-1985 dictatorship, concerns about present human rights violations are limited in scope. The freedom of peaceful assembly is constitutionally guaranteed and typically respected. Organisers of demonstrations must secure authorisation from the Interior Minister, but permission is seldom arbitrarily denied. The freedom of peaceful assembly is constitutionally guaranteed and typically respected. Organisers of demonstrations must secure authorisation from the Interior Minister, but permission is seldom arbitrarily denied. However, recent legislation that would allow the police to intervene without any judicial authorisation to clear streets and roads of obstructions have been criticised by CSOs and the national human rights institution. Constitutional guarantees of free expression are normally respected in Uruguay. Attempts to censor material are extremely uncommon and criminal penalties for the defamation of public officials were eliminated in 2009, although other forms of defamation remain criminal offences. Constitutional guarantees of free expression are normally respected in Uruguay. Attempts to censor material are extremely uncommon and criminal penalties for the defamation of public officials were eliminated in 2009, although other forms of defamation remain criminal offences. There are recent reports of public servants taking legal action against journalists or media outlets. Even though progress on the investigation of crimes against journalists under the dictatorship is slow, there is currently no physical risk for reporters. There are no restrictions on Internet access or online content. The press is diverse and privately owned, while the broadcast sector includes both private and state-owned stations. The Media Law, passed after major civil society debate in December 2014, is still lacking proper implementation. An Access to Information Law based on a civil society initiative was passed in 2008. A recent report, however, shows that compliance is still unsatisfactory, particularly regarding the justification of information classification and the implementation of active transparency requirements.